Ok just few questions before i start to claim. - Is there any kind of lighting guidelines ? - can I style mix ? - Should i be adding north markers ? 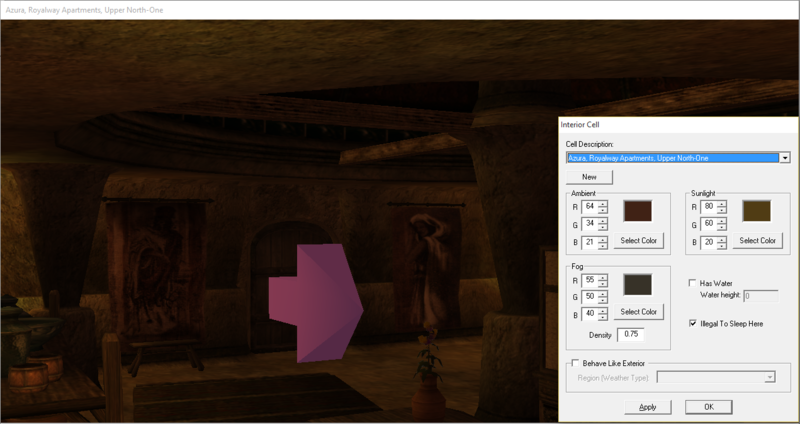 - Since I'm building interiors strait into the released file do i add door markers ? griff wrote: - Is there any kind of lighting guidelines ? I like to have some variety from building to building, so no requirements or anything. But, in general, the fog setting should be set to 0.75 (unless it's a tavern or something) and the lighting should be on the darker end of the spectrum. These setings give a nice, warm, feeling. - can I style mix ? In general, no. There may be special circumstances but certain architectures just don't make sense in Lyithdonea (Hlaalu and Telvanni come to mind). And special circumstance would still need to make sense from the exterior. If there are particular models from another set that you think would work well with the architecture you are working in, then I may retexture it to match. - Should i be adding north markers ? Ideally, yes. I know that I am often bad about adding them, but they need to be there in the end. - So i work from the main .ESM ? (I just find it strange that you don't have a .BSA file to work from.) I considered using a BSA initially, but there was a lot of push back and reasoning from the community to not use one. To be honest, they're a bit of a pain to maintain so I decided not to bother. So, yes, make your plugin dependent on the main .ESM and I can merge it into the main file. - Since I'm building interiors strait into the released file do i add door markers ? Doormarkers should be fine based on my experience of merging .ESPs into the main file. Let me know if you need anymore clarifications! Ok so id like to claim Re-01 and Re-02 for my first claims if that's possable. Just so you know, I have created the other claims maps which you can look at in this thread, I just haven't created the threads and descriptions for them yet. If anything else strikes your fancy, just let me know. Thanks again, griff! I appreciate all the help I can get. Downloaded, thanks for sending it over, griff! Griff, the interior looked fine to me! I just added a few Lyithdonea-specific items to spice it up a little and put the owner into the Golem's Foot cornerclub. Thanks again.